7 Bedroom Detached House For Sale in Surrey for Asking Price £4,500,000. Occupying a plateau position with fine views, an impressive and spacious family house situated in a prime location within this coveted and internationally renowned private gated estate. The property is approached through electronically operated wrought iron gates leading to a large circular paved courtyard, parking for several cars and access to garage. With over 11,000 sq ft of accommodation the property offers an abundance of entertaining spaces, both internally and externally. A pillared entrance porch with double front doors leads to a delightfully grand reception area with access to all of the principal reception rooms and well equipped kitchen/breakfast room a well equipped kitchen/breakfast room, indoor swimming pool and gym. 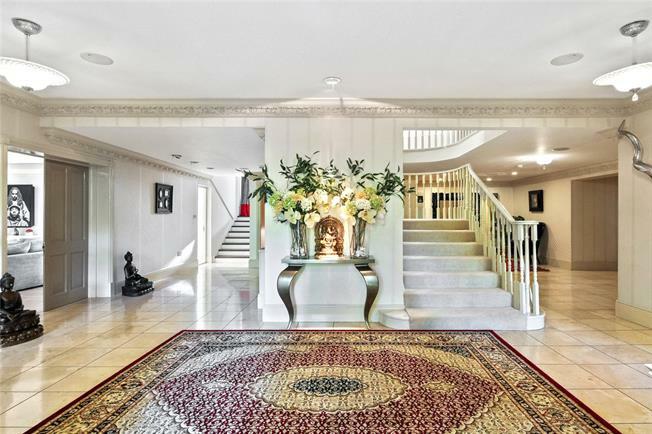 An impressive central staircase leads to the first floor with central landing giving accesses to the impressive Master Suite with sitting area having French style doors to balcony overlooking the rear gardens, bedroom, dressing room and en-suite bathroom. The guest suite and remaining four bedroom suites occupy the balance of the first floor. The extensive landscaped gardens and grounds are mainly laid to lawn with a split level terrace and a wide variety of mature shrubs and trees providing privacy and seclusion, a feature pond and fountain and carefully designed lighting.